Fresh from a class win on Saturday's (February 10) Jack Neal Memorial Rally at Blyton Park in the UK, former regional Stage Rally Champion Brandon Smith has confirmed he will return this year to compete in Sol Rally Barbados, an event he describes as "magical". 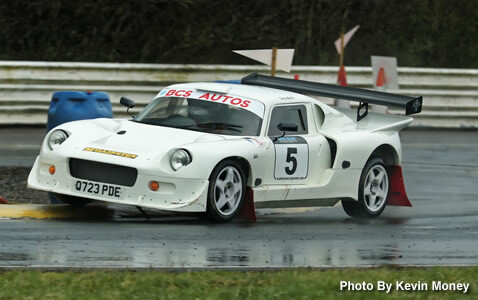 With co-driver Dylan Thomas, he will campaign his BCS Auto Repairs Darrian T9GTR+ in Group B. The 29th edition of the Barbados Rally Club's (BRC) premier event, Sol RB18 will run from Friday to Sunday, June 1-3, with The Rally Show and Flow King of the Hill on May 26/27. Since entries opened on the official web site - www.rallybarbados.net – on October 1, more than 60 have been posted; the on-line entry list will go live this week, including those among the record overseas entry that have already been confirmed. Welsh garage owner Smith won the 2016 Association of North West Car Club's (ANWCC) Stage Rally Championship, also the SD34 Stage Rally Championship in 2015 and 2016, while co-driver and fellow-countryman Thomas has won ANWCC titles on both sides of the car: in 2012, he was the Novice Driver Champion in a Peugeot 106, having previously won class co-driver titles. Smith is eagerly looking forward to returning to the Caribbean's biggest annual motor sport International; the timing is ideal for a family trip, including their sons Eric and Sion, as he and wife Bethan will celebrate their wedding anniversary and Bethan a milestone birthday during their stay in the island. Smith says: "After I'd been to spectate the year before, deciding to compete in the Polo last year was easy. It isn't that I don't enjoy the events that I do here, but Rally Barbados is just magical; it is as much the people, the friendliness, the beaches as it is the event. With the kids and other friends who are coming to support, I think we'll have a group of around 10 or 12." Last year, Smith and Thomas finished 47th overall and fourth in Clubman 1 in a Volkswagen Polo built specially for the event and harking back to Smith's first rally car 26 years ago, a Volkswagen Scirocco. This year, he will campaign his 2.5-litre Millington-engined Darrian, only the second time the only Welsh car manufacturer has been represented in the event. Following Saturday's outing, Smith is unsure whether he will tackle any more events before Sol RB18: "There's the Anglesey event that I won last year, so I'd be starting at number one, but it is just a couple of weeks before the car needs to ship to Barbados. Basically, the car is ready to go, so I'd only be just wearing it out a bit more." Other Sol RB connections in action at Blyton on Saturday included members of Worksop & District Motor Club, of which island regular Martin Stockdale is President, including Stockdale's son Tom, competing in his first rally. Stockdale Senior will compete in Barbados for the 18th consecutive year, again with his Divi Southwinds Beach Resort/Drive-a-Matic/Canems Engine Management/Quarry Motors BMW 1M Coupe and with Mark Swallow co-driving. Club Chairman Mark Hamilton said: "Any Club is only as good as its membership and its volunteer base. The success we have enjoyed over the past 60 years has not been an accident. We have been fortunate to be blessed with committed and enthusiastic persons, many of them descended from our Founders, and all of whom have thrown their weight behind the Club and its future." Awards were also presented to a number of the Club's commercial partners, Automotive Art, Banks Holdings, Barbados Tourism Marketing Inc, Chefette Restaurants, Flow, Simpson Motors and Sol (Barbados) Ltd, along with marshals, medical support teams and the media.